Simplicity, purity, new. It’s invigorating to start something fresh. 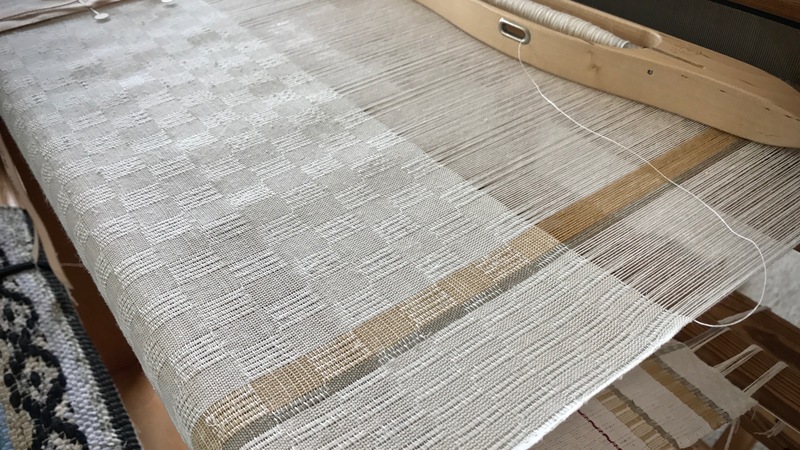 Weaving this delicate cloth in neutral colors is calming, but not boring. The linen sheen makes it spectacular. 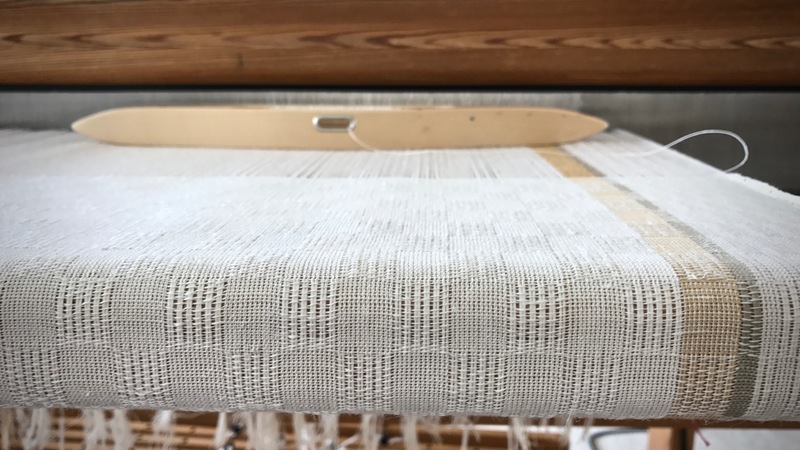 This is the delightful texture of M’s and O’s on a cotton warp, with linen weft. Peer across the cloth at a lower angle and you will see the linen’s pearlescent glory embedded in the woven texture. Structure of M’s and O’s puts interesting texture in the fabric. The texture will be intensified after the fabric is cut from the loom and wet finished. Towel has reached the midway point. The best creation is what happens inside of you. There is hope for all those who long for a fresh start. 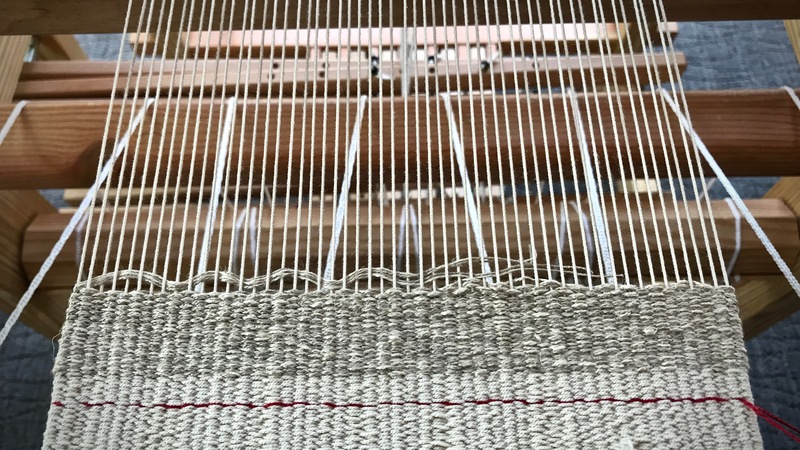 The dusty and worn threads are replaced with a new warp. Cut my selfish ways off the loom, Lord. 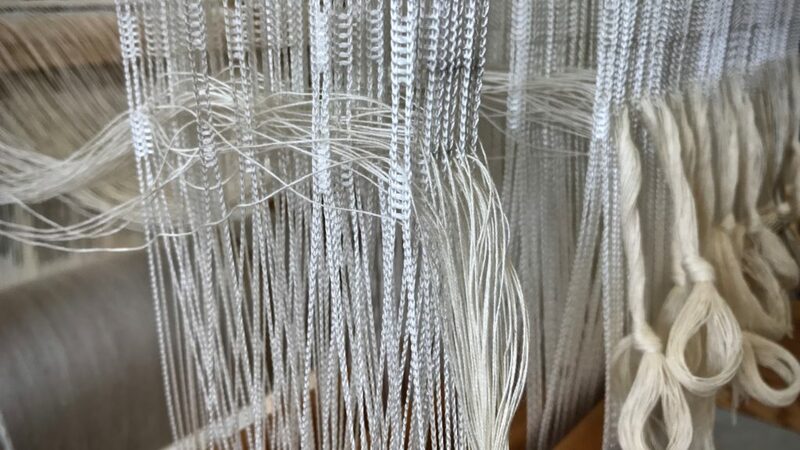 All the preparations have been done by the Grand Weaver that enable weaving to begin. Create a clean heart in me, Lord. Let my life glow with the linen of your Spirit woven through my soul. By request, I have put the towel kits back in my shop! The River Stripe Towel Set, Pre-Wound Warp and Instructional Kit, for $150 per kit, is now listed again in the Warped for Good Etsy Shop. Happy weaving! Beautiful, Karen! I’ve never worked with linen. When used as weft, does it have to be kept damp? Seems that I once read this was necessary when linen is used as warp but, I could be dreaming. Hi Beth, I like to keep linen weft a little damp because it behaves better for me that way. It doesn’t take a lot of moisture. Just holding a damp cloth around the wound quill for a few seconds is enough. The moisture makes the linen relax, and it lays more straight and flat in the shed. Without some moisture, the linen has a tendency to get little kinks and curls when you beat it in. When used as warp, some moisture can be helpful. Houston is pretty humid, but in drier climates some people run a humidifier when warping with linen. Linen is wonderful to work with. You should try it. Using it as weft is a good way to start. Beautiful weaving! I have a special place in my heart for linen, since it is what I learned to spin first. And I having linsey/woolsey on my future to-do list! Hi Bev, I admire anyone who can spin! Spinning linen seems like such an interesting process. Is linsey/woolsey linen and wool combined? Thank you for your time and wisdom, as well as weaving knowledge. You’ve encourage me to have a go with linen. 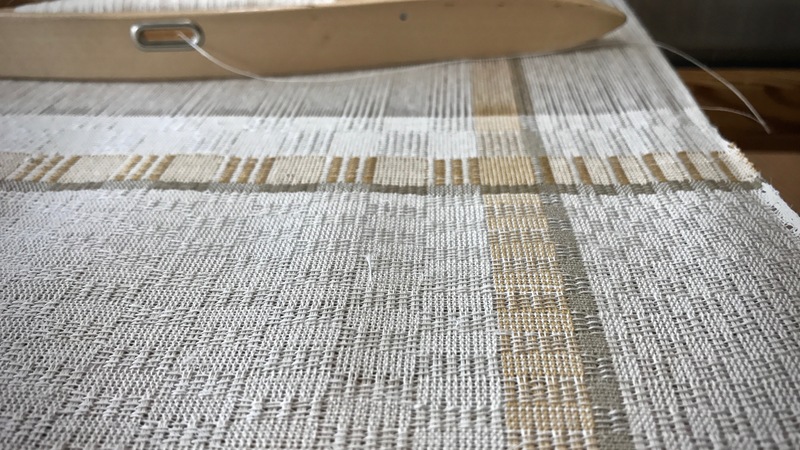 There is so much brouhaha in much of the weaving talk here in Australia about using linen. How difficult it is, how fickle, how tetchy (all unfounded, no doubt). So most of us have backed away from such a ‘difficult’ fibre. Your example here shows us the very opposite. With careful planning and consideration for linen’s ‘needs’ why should we miss such weaving pleasure. I really admire the way you have crafted the Christian message into your daily work and passion. And, I must admit, after reading your blog posts I have really thought how I can apply the same ‘message’ into the writing work that I do for children. I write children’s books for my ‘day’ job (when not weaving!) and I endeavour to give a ‘heart’ message in all my books. One where my readers are touched by a subtle message from more than what I am. So, thank you for sharing with us. And if I’ve encouraged you to live out your faith with a little more intention, then you are an answer to prayer. It doesn’t surprise me that you are a writer, as I see how beautifully you’ve chosen your words. 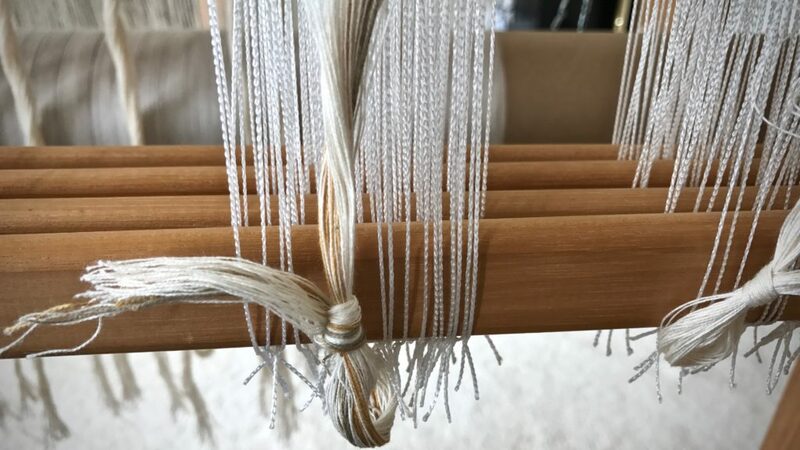 I’m a new weaver and really enjoy your blog. I was wondering if you worry at all about different shrinkage rates for the cotton and the linen? I keep hearing people say that different fibres react differently. Or do cotton and linen both shrink the same? Eventually, I would like to have a metric reed (or two) in every possible size. Until then, I will be happy with what I have, while I gradually add to my supply, as needed, one reed at a time. 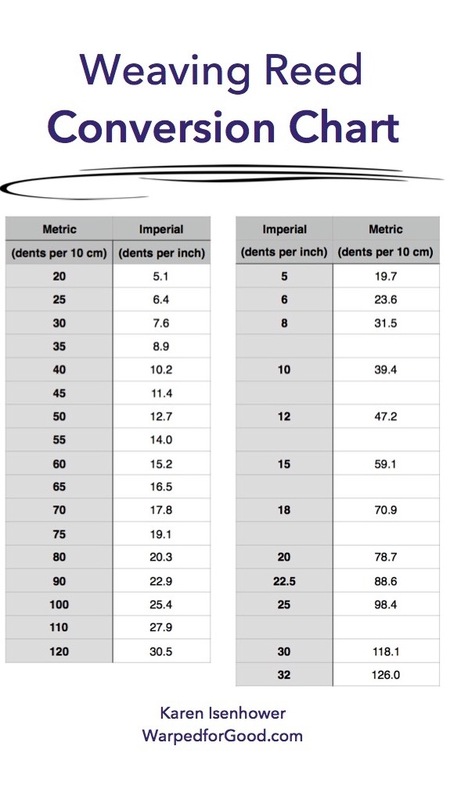 I prefer metric reeds (dents per 10 centimeters) over imperial reeds (dents per inch). For one thing, the math is easier for project planning. And because there are smaller increments between sizes, there are more sett choices with metric reeds. It could be my imagination, but it often seems that the metric reed yields a Goldilocks “just right” sett. Supply of reeds. Some purchased new, some second-hand purchases, and some received as gifts. 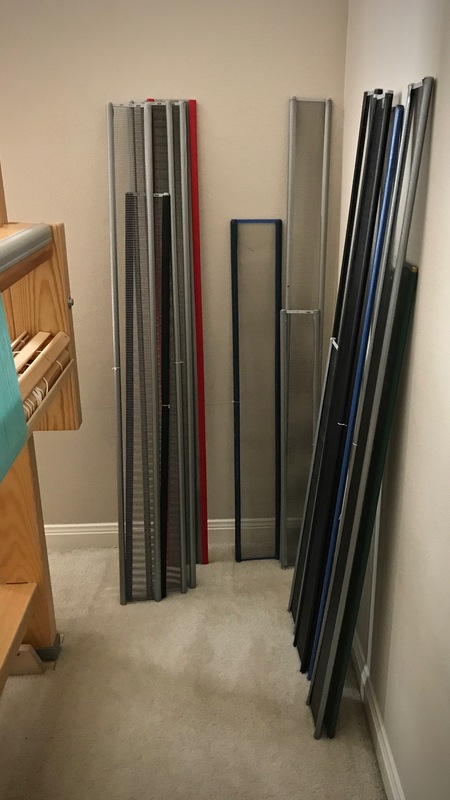 All but one have been used on my looms. The reeds usually reside in my weaving supply closet. My selection of reeds vary in length, from 70 cm (27″) to 120 cm (47″), to fit the weaving widths of my looms. But Glimåkra countermarch looms have beaters that are open on the sides, so I can use any length reed in any loom. 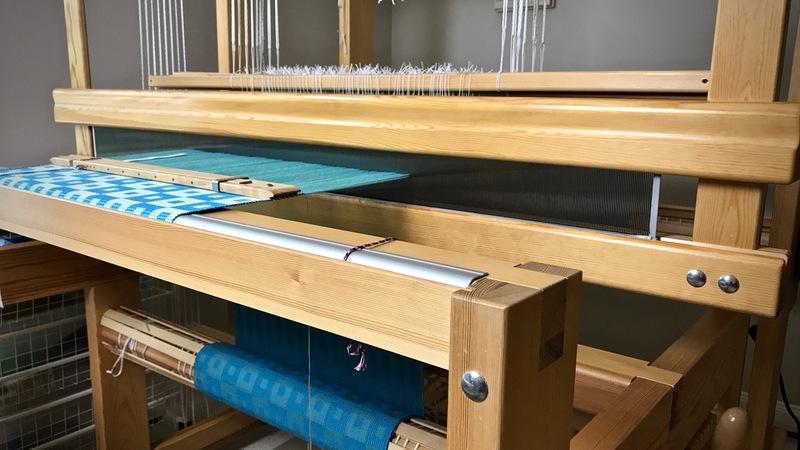 Reed with 120 cm weaving width is being used on this 100 cm Glimåkra Ideal. This is a 22.5 dents/inch reed, sleyed two ends per dent. Notice that the warp is high in the reed? That’s because the front tie-on bar is going over the breast beam. 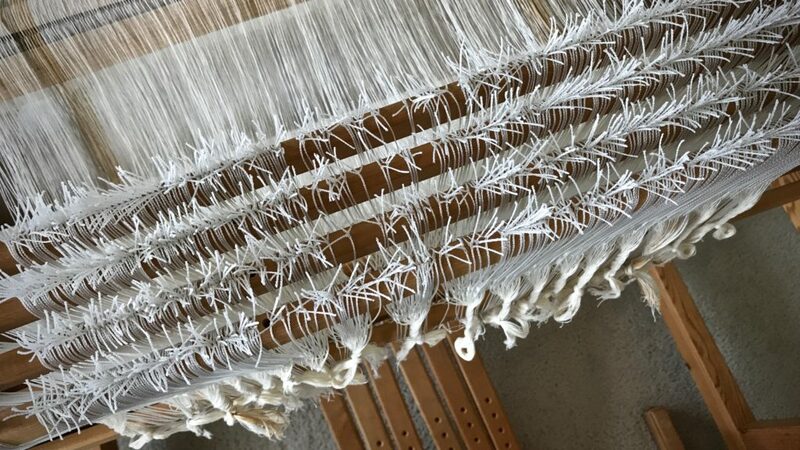 This 120 cm reed is a perfect fit for the weaving width of the 120 cm Glimåkra Standard loom. This is a 50/10 metric reed, giving a Goldilocks “just right” sett for this 8/2 tencel taqueté. I put together a reed conversion chart so that we can see our options at a glance. You never know when a new project will “require” a new metric reed! May your next project have a Goldilocks “just right” sett. I’ve recently purchased a loom made in Japan which has a metric reed. It is taking me a while to convert my calculating mind from Imperial to Metric measuring. Your conversion chart will be a tremendous help. Thank you. Julia, Have fun with your new loom! Thanks for the conversion chart. It will be helpful. I hope you don’t mind that I printed it out to hang on my studio bulletin board. Hi Jenny, I’m glad the chart is helpful for you! Please put it where you can use it. That’s what it’s there for. Thank you for putting this together, Karen! 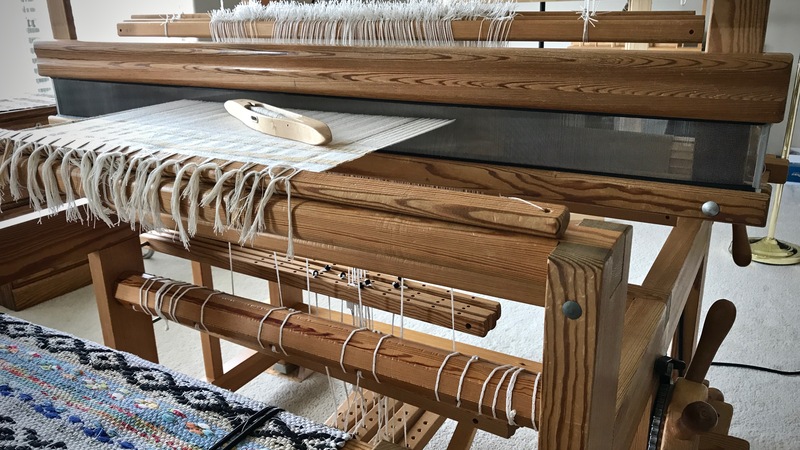 My first loom was made in Hungary, purchased when we were posted there with the military. It came with two reeds, one of which is 65/10 cm and the other (which I’ve not used yet) I think is about 23.6/10 cm. I was ripping my hair out in December, looking for some conversion charts to assist in calculating sett for a handspun scarf. I, too, would like to print out your chart to hang on my studio bulletin board. I was thinking this morning, just before sitting at the computer interestingly enough, that I’d like to get more metric reeds for this loom. As the reed holder is a bit of an oddball width here in North America, my choices seem limited. I must explore options further. Hi Sandy, I searched online for a reed conversion chart, so I could link to it, and I couldn’t find one that was as complete as I wanted. So I decided to put a spreadsheet together to do the math, and create my own chart. Please use the reed conversion chart however it serves you best. Suppliers for metric reeds in the US are quite limited, as imperial reeds are usually the American favorites. thanks, Karen. your chart is just what I need. I have Metric reeds,but also like to use patterns from Handwoven magazine. So your printed out chart will also hang in my loomroom. Hi Shirley, That’s great! I’m glad you have a use for the chart. Thanks so much for this Karen! I have a mixture of imperial and metric reeds and until recently I have been referring to my 1970’s Toika handbook (the one with the lady setting up the loom on a rocky Finnish beach!) which had a blurry picture of a reed conversion chart. Thank you! Hi Louise, I’m happy it helps you! It will be worth it. 896 threads through these heddles, and then two ends per dent in the reed. This is the necessary dressing of the loom. I do it nine minutes, thirty-five minutes, and twenty-two minutes at a time. I do not accomplish it in one sitting. After accumulating almost five hours of threading, I’m ready to sley the reed. Colored threads are 16/2 cotton, thicker than the 24/2 unbleached cotton threads. Checking for threading errors before tying the group of ends into a loose slip knot. It is easy to lose concentration when there are so many ends. The M’s and O’s threading has just enough variation in it to make me wonder if I did keep it all in the correct sequence. We will find out. The threading, correct or not, is always revealed as the fabric is woven. Texsolv heddles on four shafts, threaded. Glimåkra Ideal. Two ends per dent are sleyed in this 22.5-dent-per-inch reed. What is faith? Faith is putting your trust in something you have good reason to think is true. Stand firm, immovable, in your trust in the Lord. You put threads in the heddles because you have good reason to think these threads will become fabric. Don’t quit. Keep coming back to it. Be strong in faith. And do it from a framework of love. Your framework is always revealed in the cloth of your life. Anxious to see this project woven too. Your patience and fortitude for taking on difficult projects amazes me, a fellow weaver! Patience and fortitude are virtues, so thank you for that compliment. 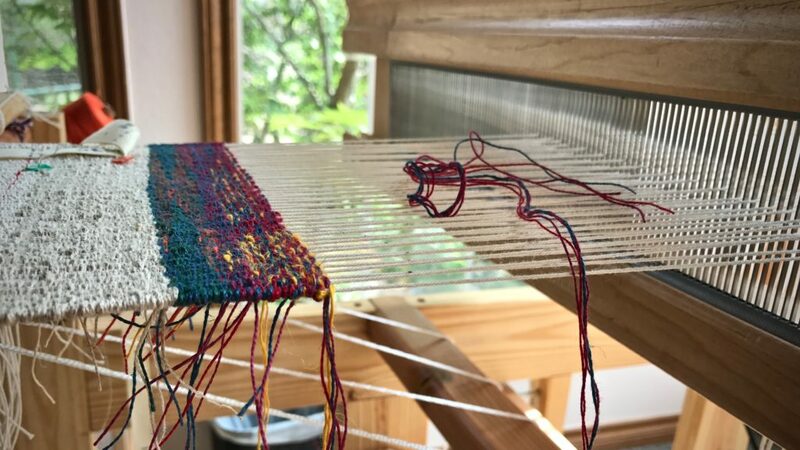 One reason I enjoy weaving so much is there are continual opportunities to stretch my knowledge and experience. I have started this tapestry sampler three times. The biggest problem was the header. I had so much draw-in that warp ends were breaking at the selvedges. Cut off and tie back on. I knew what to do–bubble the weft. But again, the second time, I had too much draw-in. Maybe I can ease the width back out to where it should be… Nope. 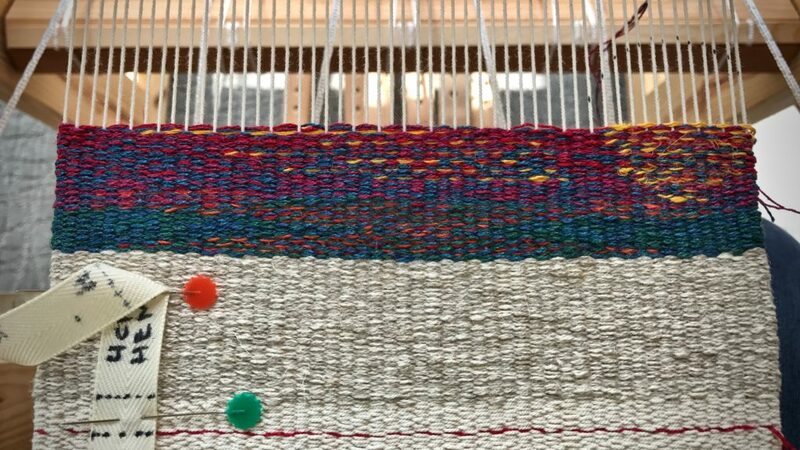 After several hours of weaving with beautiful linen butterflies, and breaking more warp ends, I gave up. 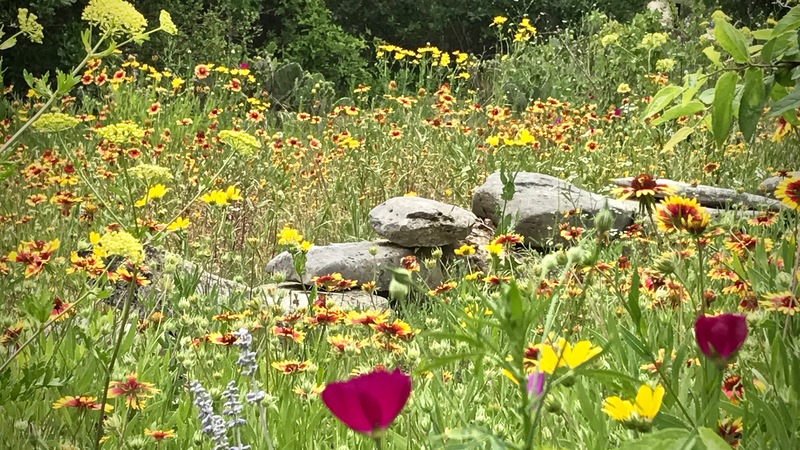 Texas hill country wildflowers fill the landscape with color. I carefully removed all of the linen weft, and took out all of the header. Start over. Again. I did what I should have done from the start. Bubble the weft MORE. It works! Now I have a great starting place for the tapestry weaving to flourish. Until I had a good header, I was wasting my time trying to make the tapestry work. Successful header is the foundation for this hem of bleached and unbleached linen. Tapestry sampler begins with some color shading, using butterfly bundles of linen in vivid colors, borrowed from the wildflowers. Windows let in the Texas hill country sunshine. 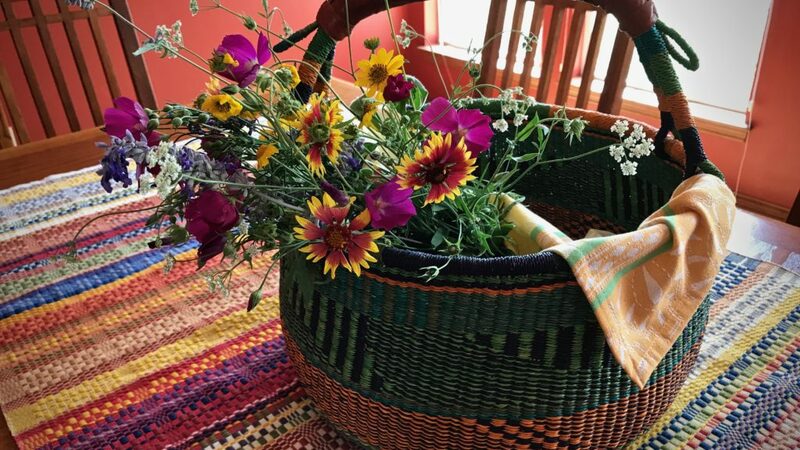 Monksbelt cloth on the table borrows the colors of the wildflower bouquet. Words are like a header for our view of the world. Words shape our thinking. Listen carefully to test words, like you test food on your plate by tasting it before eating the whole thing. Test the words you hear. And only swallow what is right and good. If the header is good, your tapestry can flourish. May you hear words that pass the test. As a follow up to Quiet Friday: Favorite Weaving Books, Besty Greene sent me this picture. I love it! I am sending you this message in the theme of your last blog post. Ta da! 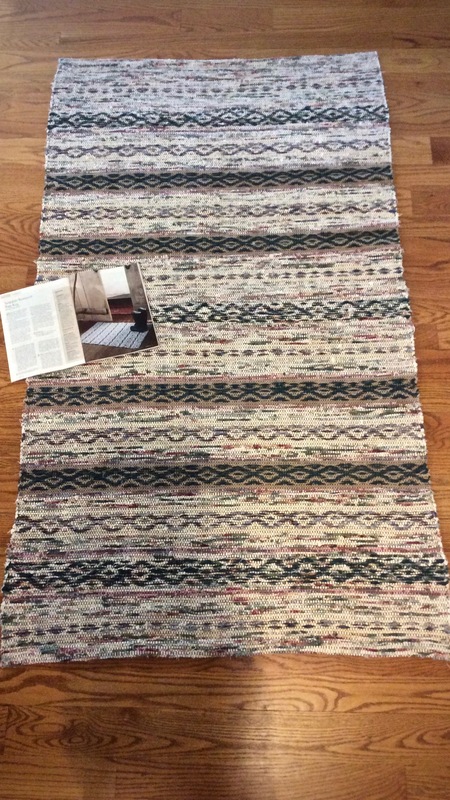 A rug inspired by your project in Handwoven. Rag rug by Betsy Greene. I’m curious to know what you mean by bubble the warp. I’m unfamiliar with that term. Hi Cate, Bubbling the weft (not warp) is placing the weft in waves, or bubbles, across the shed. 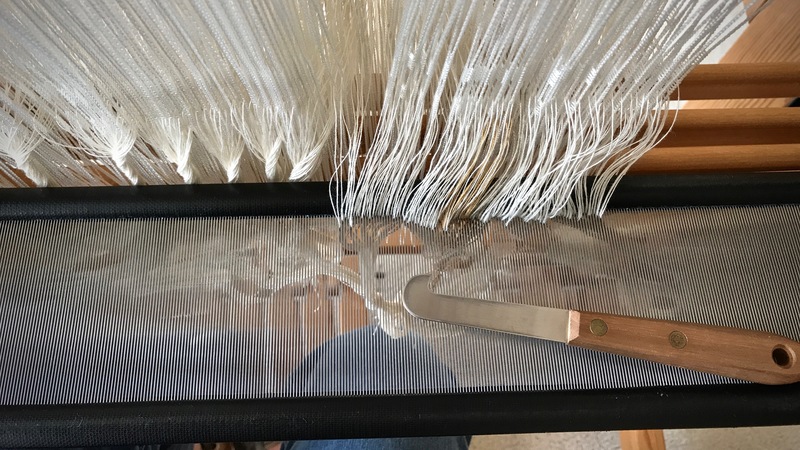 Click here to read my definition in the Weaving Glosssry: Bubbling. And here is a picture of bubbling the weft. I didn’t get a picture of placing the weft for the header, but this is a picture of the hem area of the tapestry.